Visitors from all parts of the UK plus Austria, Belgium, France, The Netherlands and South Korea flocked to Weymouth for BIAFF 2012 on 13th - 15th April based at The Hotel Rembrandt. Thursday: early arrivals enjoyed a show by Weymouth Cine & Video Club which concentrated on films about the area. Some of them were outstanding and were being talked about all weekend. Friday: An afternoon tour took delegates to the "Isle" of Portland (actually a peninsula with a narrow causeway linking it to the mainland.) There was an unique opportunity to visit the National Sailing Academy on Portland, where the Olympic teams were training, led by one of the founders of the project. In the evening, before a packed house of nearly 180 delegates, John Rowell and Marion Waine presented a selection of sequences from the 2012 IAC Peter Coles Audio-Visual Competition. John introduced each item with great warmth and humour, while Marion handled the technical aspects. There was a buzz of enthusiasm from the audience for several sequences. The passion and personal nature of Malcolm Imhoff's Soul Music, where a dawn ascent of Mont Blanc became a religious experience, was very popular. The Great Prairie by Jean Paul Petit and Jacques van de Weerdt based on the paintings of Edward Hopper was much admired. Few had expected outright comedy, but Dave & Carol Gillow's piece Pirates featuring a tale for children and a dreadful pun got broad laughs. An interesting blend of humour, AV and video, Little Ted's Birthday Surprise by John Smith & Jill Bunting also raised plenty of smiles. After the applause for the moving biography entitled Thomas, the authors Linda and Edgar Gibbs were invited to talk about it. The sequence deals with a remarkable Irish foundling escaping poverty by joining the British army ... and follows the family story to the birth and marriage of Edgar Gibbs himself. They won the Runner-Up Trophy and proved as entertaining a live double-act as they are great AV authors. The evening culminated in the impressive winner of the IAC Peter Coles Trophy, Le 203 ème Jour (The 203rd Day) by Christian & Danièle Brion. The piece is narrated by a premature baby who talks of the first vague impressions of other people, later the awareness of touch and voices as she develops. As the infant grows stronger and stable it sends with her telling us she now feels ready to love and be loved. The evening gave us not just an entertaining time but also an indication of the superb technical standards of the festival with bright clear pictures on screen and an astoundingly good sound system - achieved, we are told, by judicious use of contacts in the music world to obtain loudspeakers and the expertise of Ted May and Neil Anderson and the rest of the team from Bournemouth Video Club using sophisticated metering of the room's acoustic characteristics and careful setting of a graphic equaliser. Saturday: four mini-cinemas were in use - each blacked out with the amazing Magic Blackout plastic material which uses static electricity to stick to any flat surface. Teams from Bournmouth Video Club, Frome Cine Club, Weymouth Cine & Video Club and Wimborne Minster Cine & Video Club provided equipment, staff and expertise. All the programmes had been prepared on a single Blu-Ray disc per session, complete with opening animation, captions between films and so on. Apart from a couple of picture jitters here and there, it worked well and avoided the usual cries of "Wrong format!". In the largest cinema, also used for Sunday's Gala Show the large screen had been lent by CEMRIAC. IAC Competition Manager, David Newman, had organised programmes that provided a good range of films in each session. In each coffee break there was talk about what had just been seen and debates about the star ratings. The only risk was that the Hotel Rembrandt's meals were excellent and generously sized from breakfast to dinner, so it was tempting to doze for the first few minutes of each session until the quality of films compelled attention. In each mini cinema the same very high standard of projected image and sound quality we had seen on Friday night was maintained. After each film, the IAC Council Member acting as host in each cinema presented certificates to those film makers who were present. Sam Brown There was some disappointment that the special session devoted to films by younger makers and compered by Sam Brown, did not attract more of the film makers themselves - not even those from a local primary school whose film was screened. Certainly we were in the last days of the Easter holiday, but perhaps IAC will have to reconsider ways of running this session in future. On Saturday evening the main cinema was converted back to its normal look as a function room for the gala dinner. While formal dress was not required, many people enjoyed dressing up for this occasion. Among the "penguin-suits" and formal frocks were Korean "Han Bo" and a Scottish kilt. The loyal toast was proposed by SOCO Chair, Anne Vincent. The toast to the IAC was given in memorable style by Dr. Georg Schoerner, General Secretary of VÖFA (the Austrian equivalent of the IAC). He began in a deceptively formal style, but soon had the room rocking with laughter with his comments on his experiences of Britain. National Chairman, Ron Prosser, responded with similar light-heartedness. Pip Critten acted as MC and did a memorable comedy magic routine which left us all wondering how he had done it, even while chortling at his jokes. IAC President, Reg Lancaster, presented the UNICA Medal for services to the hobby. His build-up kept most of us guessing until he revealed the recipient was Michael Gough. Michael is well known and extremely popular, so this was greeted with a storm of applause. Potters Bar Filmmakers received warm congratulations for having passed their 60th anniversary. The guest of honour was actor and producer, Michael Medwin. His speech was, of course, beautifully delivered and very funny. His charming wife revealed later that, true professional as he is, Michael had refused alcohol before his speech. One of her duties was to have a large glass of wine ready for when he sat down again! Not that he was allowed to sit for long since prolonged applause made him take several bows. Typical of the many very special touches of this BIAFF ... instead of presenting Mr. Medwin with a traditional gift of wine, cigars or flowers, the Festival Officer, Eric Montague, had discovered that Michael did not have a copy of the theme tune recording from the TV series which made him a household name, "The Army Game". Eric managed to track down a rare copy and that was presented to a delighted guest of honour. Sunday: The day revolved around the main cinema and the showing of the major award-winning films. But in the background our friendly film reporter from the Netherlands, Romy Van Krieken, was interviewing several of the winning film makers on camera. We hope to have some extracts of those interviews online soon. David Newman, Annabelle Lancaster and Jan Watterson spent most of each break returning discs, tapes and certificates to competition entrants. The Deputy Mayor of Weymouth popped in for the afternoon, declared herself deeply impressed not only by the films themselves but by the dedication and enthusiasm of all the people she met. Reporters from local press did interviews and assembled statistics. Several members of the public, who had heard about the event through the extensive local publicity in press and radio came along. Two sets of visitors came from London, one New Zealand actress visiting Britain and an animator from Serbia, were all attracted by a mention on the BBC website news page. Several young film makers, on the brink of a career in the industry, came along to see the work and were knocked out by the high quality of ideas and themes as well as the techniques and production values achieved by no-budget film makers. Amid a barrage of photographers, Tony Colville and Jane Andrews were presented with trophies for Reading Film and Video Makers and Bristol Film and Video Society, the two winners of the Best IAC Club Website competition. At the end of screenings Chairman, Ron Prosser, opened the envelopes to reveal the winners of the two special awards. 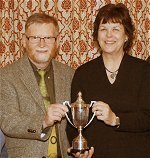 Best British Entry went to Stewart Mackay of Wiltshire for Pigeon Post. The Daily Mail Trophy for best film in the festival went to Angels on the Track by Moving Pictures from the Czech Republic. But even then there was more on offer from the SOCO team: a bonus expedition to Athelhampton stately home for a private drinks reception and viewing of the house with a special showing of From Time to Time which was shot there on location. Every BIAFF is a special event with its own special delights. SOCO - hosting the festival for the first time - did us proud.